Here is a treat for all lovers of the Great American Songbook. Well, maybe not quite all, for the confluence of names in the album title Sun Ra Plays Gershwin may sound ill-matched to Ra’s detractors. But that would be to ignore Ra’s love of good tunes and his sure touch when it came to arranging ballads and jazz standards, first for Fletcher Henderson in the 1940s and later for his own bands. You want bracingly atonal Ra? You got it, from The Heliocentric Worlds Of Sun Ra Vol. 1 (ESP, 1965) outwards. You want well-tempered melodies and solace for the soul? Try Jazz In Silhouette (Saturn, 1959), a five-star set of Ra originals and the perfect candidate for an advanced level Blindfold Test. Ra’s ventures into the Gershwin songbook deserve, in fact, to be treated with as much respect as those of Ella Fitzgerald, Louis Armstrong or any other less-polarising musician. Among the ten tracks on Sun Ra Plays Gershwin, a compilation covering around three decades of work, is one major find: a live nine-minute performance of “Rhapsody In Blue,” made with the Arkestra at the Squat Theater, NYC, in summer 1979. The credits describe the track as previously unissued and, legally speaking, that is true. But it is also available, if hard to find, on the bootleg Live At The Squat Theatre, pressed in Finland in 2012, probably in a run of no more than a few hundred copies. According to Ra discographer Chris Trent in his and Hartmut Geerken’s scholarly study, Omniverse Sun Ra (Art Yard, 2015), the musicians include: Ra on piano and keyboards, Michael Ray on trumpet, Marshall Allen on alto saxophone, John Gilmore on tenor saxophone, Danny Ray Thompson on baritone saxophone, Eloe Omoe on bass clarinet, James Jacson on bassoon, Hayes Burnett on bass, Samarai Celestial (probably) on drums and Atakatune on percussion. Audio quality is so-so but the music is transporting. Among the other hen’s teeth is “Nice Work If You Can Get It,” a home recording Ra made with Chicago vocal group the Nu Sounds in 1955. Until now, “Nice Work” has only been available on the obscure Spaceship Lullaby (Atavistic, 2003) . 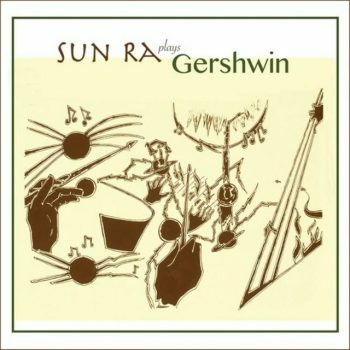 For Sun Ra Plays Gershwin the audio quality has been tweaked and improved. The other recording on Enterplanetary Koncept’s disc featuring the Nu Sounds, “A Foggy Day,” was reissued in 2016 on Strut’s excellent triple-CD compilation, Sun Ra Singles: The Definitive 45s Collection 1952—1991.